The Technical Image Press Association (TIPA) is comprised of members from magazines around the world in Europe, Asia, Australia and North and South America. 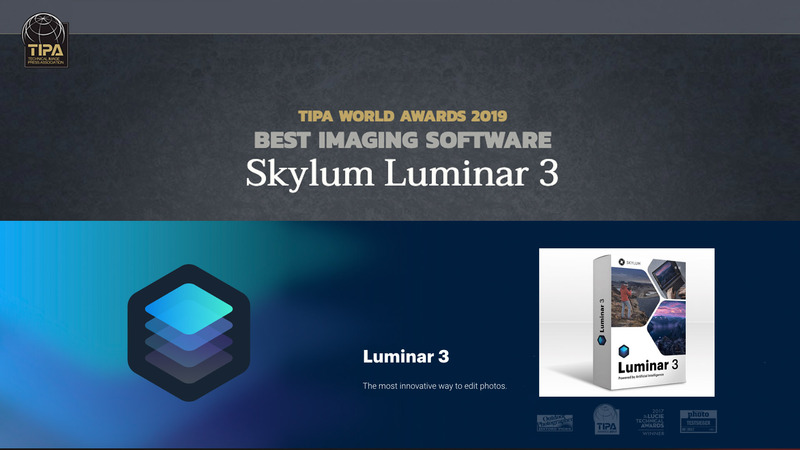 Each member publication is engaged in the selection and final vote in the TIPA World Awards that name the best photo and imaging products of the year. This year’s awards were announced in a ceremony on March 17, 2019, in Bankok, Thailand. Simplicity in an image editor need not mean being limited to only basic effects and enhancements. Luminar 3 offers a raft of tools in an efficient workspace that offers numerous Looks (presets) as well as all that is needed by many photographers to get the best and most expressive results from their images. Users can choose from over 70 default styles crafted by professional photographers plus download dozens of Looks that extends their options: both paths can be customized with a wide range quick sliders. There are also sophisticated editing tools that allow advanced users to take a deeper dive into editing. The unique AI Sky Enhancer filter makes sky rendition a quick and easy operation. -TIPA award announcement. Your photographs deserve award-winning post-production. Save on Luminar 3, learn more here.